Thanks to a great piece of writing with sound research, “Will the last one leaving the Bay Area please turn out the lights?” by Patrick Carlisle, Chief Market Analyst at the residential real estate powerhouse, Paragon Real Estate Group, these “news” articles are shown to be the result of wishful thinking combined with journalists’ propensity to be statistically challenged. 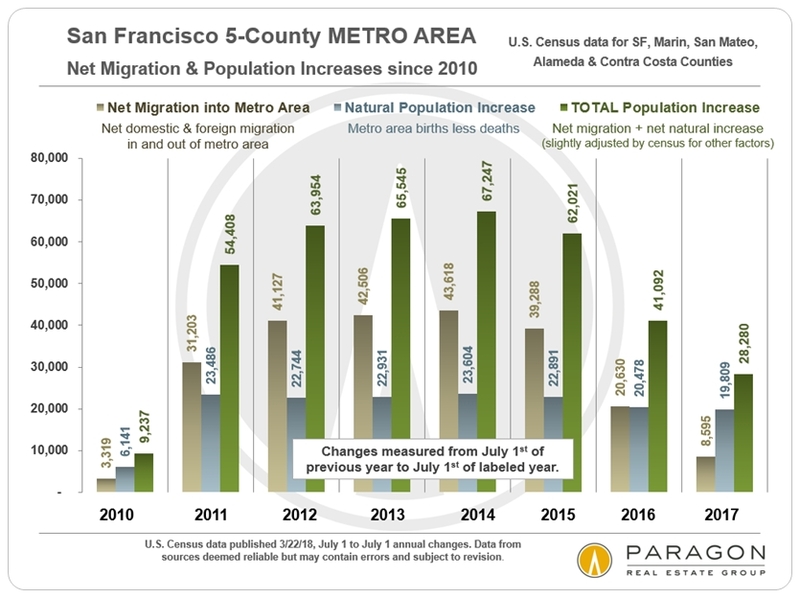 Patrick looks at the complete picture including foreign in-migration, his result: the Bay Area’s population is growing nicely. Thank you! THE IRONY: For the Bay Area to solve our housing crises, we need this fake news to be true. UNFORTUNATE FACT: The 101 cities in the 9-County Bay Area will not allow enough housing to be built to meet demand. ONLY REMAINING SOLUTION: For home prices to stabilize and for rents to ease, we need more people to leave the Bay Area than move in. WHY THE ONLY SOLUTION? Supply and Demand. Just as climate change is the “inconvenient truth” that is denied by many on one end of the political spectrum, supply and demand is the “inconvenient truth” denied by many on the other end of the spectrum. Climate-Change deniers do not want to confront the need to change. Supply-Demand deniers also want to put their heads in the sand. Our Bay Area political power base is full of Supply-Demand deniers. Their social engineering solutions to our housing crises, like rent control and inclusionary housing, may make these politicians feel good and give them an image of doing something. But the percentage of economists who say that these policies make our housing crises worse is probably about the same as the percentage of climate scientists who point to man’s activities as the greatest cause of climate change. The law of supply and demand is like gravity, we cannot wish it away. First, before we discuss displacement policy options, let’s step back. The Bay Area has a problem that most regions of the USA and the World wish they had. Because of our universities, innovative talent is here, bringing capital and corporations to monetize the innovation. This in turn attracts more talent: What economists call “a virtuous cycle”. Every region wants to be the Bay Area. Frank Sinatra once sang about another economic powerhouse, “If you can make it there, you can make it anywhere!” That same sentiment attracts the world’s best and brightest STEM talent to the Bay Area. But once here, those individuals see the Bay Area’s unique infrastructure for innovation and soon doubt the second portion of the refrain. “Could I really make my dreams happen anywhere?” Most conclude, “Probably not.” Thus, the Bay Area’s status as the world’s center of tech innovation stays secure. Some of San Francisco’s most dangerous Bay Area politicians think that they can disrupt this virtuous cycle by making it difficult and expensive for Tech companies. “Let’s run them out!” They do not realize it is not the companies that drive our region, it is the talent. Even if the most radical San Francisco mayoral candidate could waive a magic wand tomorrow and blow up Facebook, Twitter and Salesforce, the Bay Area’s magnet for STEM innovators will still hold its power. Why can I say that? Because, it happened once before. The simultaneous Dot-Com and Tel-Com crashes in Silicon Valley created the largest percentage sudden drop in employment of any urban region since the Great Depression. Tech employers evaporated overnight. Ten of millions of square feet of office and R&D space became vacant, often with the phones, pc’s and desks still in place. Unemployment shot up, but almost all the tech talent stayed. Unemployed Bay Area engineers continued to innovate and some of their start-ups, born in the Dot-Com Crash, are now huge. These dangerous politicians also must recognize the fact that despite the boundaries of their political fiefdoms, the Bay Area economy functions as an economic whole. If you chase these companies from San Francisco to East Palo Alto, the regional impact on the demand for housing is largely the same. WHY CREATE A COORDINATED DISPLACEMENT POLICY? Because displacement is occurring: The annual amount of Bay Area displacement is more than an order of magnitude larger than net population growth and even greater when compared to the number of new housing units created. If we can shape something this large, even slightly, through public policy, there will be a meaningful impact. Who is currently getting displaced? We all bemoan that the wrong people are getting pushed out, what John McNellis calls “the great hollowing out” of the Bay Area. What is needed to prevent this? We agree on that as well: The Bay Area needs more working class/middle class housing. Where is our working class housing? Without driving to Oakley, Hollister, Fairfield or Tracy, you can find working class housing in only one place, our existing housing stock. What new housing do our local housing policies create? (A) The top of the economic pyramid gets luxury housing. And (C) the bottom of the pyramid gets a slim chance to win one of the few inclusionary units extorted out of the developers of (A) luxury housing. There is no B. And, C only happens if A happens. This is unstable. Current land use restrictions, government fees and exactions plus pressure from NIMBY’s set up a cost structure where only luxury units make economic sense to build in most of the Bay Area. But, the top of the income pyramid is by nature small. A small market can be easily overbuilt and we are seeing signs of this already in certain markets in the Bay Area. When a market gets overbuilt, developers lose money and stop building. The lottery of subsidized units then comes to an end. This is counter productive. Newly built units in a market put a cap on the value of the vast amount of existing units. “Why should I pay your asking price for your old townhome, when I can buy a modern, new unit nearby for a cheaper price?” Newly built units are roughly 15% of annual sales in San Francisco with a lower percentage in many Bay Area communities. The higher cost paid by the buyer of that new unit due to the inclusionary exaction is also paid by 6 or more other buyers of existing homes. AGREEING ON DISPLACEMENT POLICY MAY BE EASIER THAN AGREEING ON HOUSING POLICY: Who should we incent to move out of the Bay Area? It’s easy: Those no longer contributing to the local economy and local culture in a meaningful way. This will largely mean my generation, the Baby Boomers. The graying of the Bay Area is well documented. Rent Control and Prop 13 are major impediments to oldsters moving. But, Baby Boomers hogging the housing stock is a problem in many places. London toyed with a tax on unused bedrooms as a way to pry Baby Boomers out of their big homes and better utilize the existing housing stock. As you might guess, this proposal was unpopular and soon became a political baby with no father. Promoting displacement needs to be addressed now before the Baby Boom ages any more. People might accept change in their 60’s, but as they move through their 70’s and into their 80’s, change becomes scary. Also, late in life the children tend to get involved. It only takes one sibling to think more about their inheritance than mom and dad’s happiness and welfare, for the siblings to disagree: Then nothing happens. As a student of the Bay Area Economy and its impact on commercial real estate markets, I am a big believer in free markets. Market forces can seem brutal but free markets are self-correcting and use resources in the most efficient fashion. However, once you jimmy a free market, unexpected negative consequences arise. Prop 13 jimmied our housing market. Prop 13 is the third rail of California politics; it is not going away (at least for housing). We need creative politicians to spot and clean up the messes that Prop 13 created. Bay Area government agencies, non-profit and private groups should create social services to help older people make the transition out of the Bay Area. This should be more than just a realtor coming by to tell the homeowner how much money they could get for their house. Counsel the Baby Boomer on how to let go and move on. Help them investigate new communities outside the Bay Area. Organize friends to think about moving together. Give these groups tours of potential retirement locals. Help empty nesters deal with their memories and all that stuff. (The kids don’t want your old stuff anyway.) Study the problem. Unleash the Sociologists! If you talk to a retired person or someone who is afraid to retire, besides the attachment anxiety outlined above, you will hear financial worries. If their house is paid for and they have a low property tax assessment due to Prop 13, these homeowners fear they cannot afford to move. We need data to show that the Bay Area is a high-cost place to live on all fronts, and thus the money saved on all items by moving to a lower cost area will more than pay for the increase in the out-migrant’s property taxes. These oldsters need some financial handholding. Unleash the CFA’s! The California Association of Realtors is sponsoring a ballot initiative that will allow homeowners over 55 to transfer their low tax-assessment to any other county in California. There are benefits, whether the relocation is a trade-up or a trade-down. This initiative has enough signatures to make the ballot. The Bay Area should get behind this proposition. Teachers and fire fighters unions are against it, because they think if that household moved without this benefit there would be more taxes collected to pay their wages. These unions should stand down. First off, without this benefit the oldsters may not move and their current low tax assessments stay in place. Second, such displacement is a win for the Bay Area and a win for the retirement destination outside the Bay Area. Most communities want retired people. They bring in money and do not cost much in services, because they do not have kids in school. Bay Area residents moving to cheaper areas will bring with them a lot of home-equity to spend on new homes, which will create growth (yes, most other regions want growth) and create jobs. States needs to change the rules of Age-Restricted (55+) Housing to make these communities more affordable, more inclusive and more appealing. If you would never move to an age-restricted community, you should support this product type anyway because of all the middle class housing these seniors will free up. Fast-track these projects, waive fees and exactions. Allow someone 55+ who is the owner or renter of the unit to have an adult roommate that is under 55. This could be for companionship, for care-giving or just to share the rent or mortgage. Some of the inclusionary housing money building up in a City’s coffers should be used to create displacement incentives for people willing to move out of the Bay Area. A low-income housing unit costs $500,000 to $850,000 to build in the Bay Area. Even when they have the funds, Cities find deploying these funds to be difficult. Besides the usual NIMBY problem, voters do not want to attract the unemployable or to reward those making their living in the underground economy. If a town takes that $600,000 for one low-income unit and gives out $10,000 grants to retirees to leave the Bay Area, that town could generate 60 market-rate units for the same price. A town can allocate the money to those who lived in the town the longest. Yes, a town is rewarding those who benefitted from Prop 13 the longest, but the town’s revenues suffered from those depressed property taxes. This scheme helps that town get a more robust tax-base quicker. Companies could post home listing on their employee-portals promoting homes that are within a bike-ride’s distance, say 3 or 5 miles from their offices. Companies could then match the $10,000 grant mentioned above for homes sold within that radius to one of their employees. In a bidding war, let the bidder with the shortest commute win. If accessing inclusionary housing funds proves politically infeasible, Bay Area Cities and Counties could set up the following program: If a long-time resident who is 55+ moves 100+ miles outside the Bay Area, for the first five years, so long as they stay away, they will receive annual checks for half of the increase in property taxes on their old Bay Area home. Support GSE (Fannie, Freddie, HUD) reform to have the Federal bond guarantees and subsidies focus on affordable housing, especially for seniors. Currently the GSEs are spending far too much tax-payer money to win away luxury apartment loans from private-sector lenders. SPUR, ABAG, the ULI and others have good government and public-policy groups who if they put their minds to it, could add greatly to this list of suggestions. Politicians, relax: If you remember not to touch Prop 13, and craft displacement policies using carrots and not sticks, displacement policies should not become a political third rail. The Bay Area needs housing. But, if you do not support massive amounts of new housing, by default, you are supporting displacement. So, please own it. Do not be a supply-demand denier. Lacking new housing, to keep rents and housing prices in check, we need displacement. Displacement should be encouraged for certain groups to mitigate displacement of others. Displacement policies should be created with plenty of thought and plenty of heart. Eric Von Berg is a Principal at Newmark Realty Capital in San Francisco.